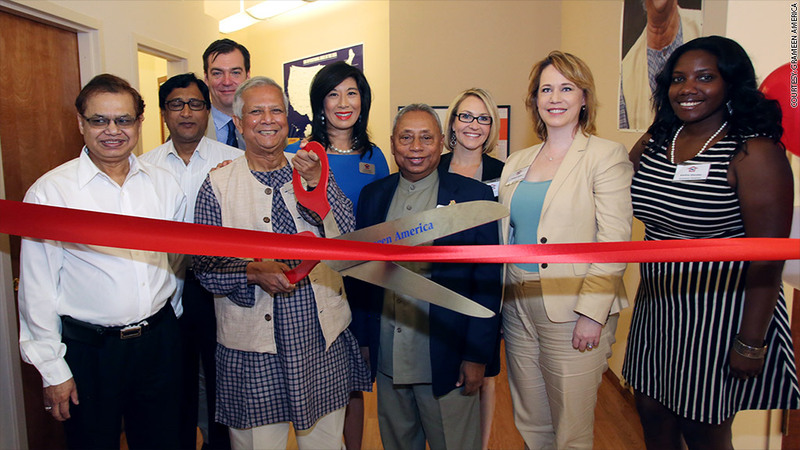 Muhammad Yunus, founder of Grameen Bank, cuts the ribbon at the U.S. Training Institute's opening. $1,500 can go a long way for aspiring entrepreneurs. And it's about to be easier for women to get this cash. The Grameen Bank made its name by offering loans of $1,500 to impoverished female entrepreneurs in the developing world. In 2008, it expanded its program to the United States. In the last six years, more than 28,000 women have received micro loans from Grameen America totaling over $150 million. Last week, the organization officially opened the doors of its first U.S. training institute in Queens, N.Y., which it will use to reach even more women across the country. In partnership with Capital One (COF), the Robin Hood Foundation and Citibank (C), the new center will act as a training school for loan officers, who are crucial to Grameen's strategy of empowering female entrepreneurs. The organization takes a peer-group lending approach: Groups of five women band together and work with a loan officer or "center manager" at one of Grameen America's 18 branches. Center managers, who are full-time salaried employees, give women financial training to open bank accounts (for many, it's their first), establish credit and launch businesses. Loan officers are the gateway to capital and play a "critical, pivotal role," according to Grameen America CEO Andrea Jung. "Part of scaling nationally is embedding best practices to our loan officers," she said. There are already over 110 Grameen loan officers in the U.S., and Jung expects the new training center to add 200 men and women to the roster in the next year. Center managers will be trained at the new center and then will return to their local branches around the country. Each manager can help an estimated 400 women get their small businesses off the ground per year. All women who receive micro loans from Grameen are living below the poverty line, and many are single moms working dead-end or unsustainable jobs. The new institute could help as many as 80,000 women a year launch their own small businesses and improve their financial situation. The center had a soft launch earlier this year, and 70 people already went through the training, including Mercedes Martinez. Originally from Puerto Rico but now living in the Bronx, Martinez received $1,500 in loan from Grameen America in January 2014. A new mom, she wasn't working when a neighbor told her about the program and suggested she start a business selling jewelery. Martinez, who had previously worked as a cashier in the jewelry business, opted to buy jewelry on Canal St. with her initial loan. "I wasn't good at money management," explained Martinez. "Through Grameen, I learned you have to save and make your money grow." Martinez paid off her loan in March. Changed by the foundation and its mission, she completed the one-month training -- which combines classroom-style learning with shadowing Grameen America loan officers -- and is now a loan officer at the Manhattan branch of Grameen. The fact that the training center is located in Queens, where the first of Grameen America's 18 branches opened, is no coincidence, according to Jung. Franklin Mora, deputy director of Queens Economic Development Corporation, said his organization refers women to the Queens branch. "The model works really well with local communities," Mora said. "As a whole, the borough could really benefit from more organizations like Grameen America to help support small businesses."